1738-1814. He was born on 11 October 1738 at All Hallows, Bread Street, in London, the son of an immigrant from Frankfurt, Jacob Phillip, who by various accounts was a language teacher, a merchant vessel owner, a merchant captain, or a common seaman. His mother, Elizabeth Breach, was the widow of a common seaman by the name of John Herbert who had died in Jamaica in 1731, and was not as has been frequently stated the widow of a captain related to the Earl of Pembroke. Educated at Greenwich Hospital School, Phillip initially saw time in the Greenland whaler Fortune from the end of 1753, before going out to the Mediterranean at the end of the following summer as a trader and then returning to the whaling fields in 1755. Joining the navy, from October 1755 he was employed as an ordinary seaman aboard the Buckingham 68, commanded by a distant relative, Captain Michael Everett, serving in home waters until April of the following year and thereafter in the ill-feted Vice-Admiral Hon John Byng’s Mediterranean fleet. Here the Buckingham was the flagship to Rear-Admiral Temple West at the Battle of Minorca on 20 May 1756. Phillip subsequently moved with Everitt to the Union 90, then the Stirling Castle 64, in which he went out to the West Indies in 1761 to serve at the siege of Havana during the following year. He was promoted lieutenant on 7 June 1762 and retired to Lyndhurst at the peace where for a good number of years he lived the life of a farmer and country gentleman following his marriage to a wealthy widow. In 1770 he served as the second lieutenant of the Egmont 74, Captain Matthew Whitwell, but with employment opportunities scarce he entered the Portuguese service in 1773 to serve against Spain in the Brazils as a captain on the frigate Nossa Senhora do Pilar 26. As a consequence of his significant participation in the capture of the San Agustin 74 in 1776 he subsequently commanded her in the Portuguese Navy as the Santo Agostinho. On the commencement of the war with France in 1778 Phillip sought a return to the British navy, and he was promoted commander of the fireship Basilisk on 2 September 1779, being later posted to the Ariadne 20 on 30 November 1781, and serving in the Downs and in convoy duty to the Elbe in the early part of 1782. During November 1782 he sailed out of Portsmouth on a cruise to the westward with a small squadron under the orders of Commodore John Elliott. Meanwhile in the autumn of 1782 Phillip had been consulted by the secretary of state, Thomas Townsend, the future Lord Sydney, on the feasibility of attacking Spanish possessions in South America. His advice proposed an attack on Buenos Aires and Montevideo before proceeding into the Pacific to attack the Spanish possessions there, with the ultimate aim being to capture Manila in conjunction with the British East India fleet. In January 1783 he sailed in command of the Europe 64 under the orders of Captain Robert Brice Kingsmill of the Elizabeth 74 with a small squadron to attempt these aims, but a storm in the Bay of Biscay dispersed the squadron and it was with much difficulty that he proceeded to the East Indies alone. Here he found that peace had already broken out, so the Europe returned home in May 1784 whereupon Phillip left his command to spend a year in the south of France, where he apparently provided intelligence on the strength of the French and Spanish navies. 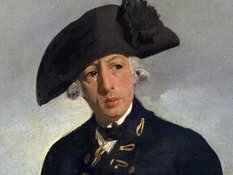 To the surprise of many, and despite the doubts of the first lord of the Admiralty, Lord Howe, he was selected by Lord Sydney to settle a convict colony in New South Wales in 1786. Setting sail on 13 May 1787 with a commodore’s broad pennant in the newly commissioned Sirius 24, Captain John Hunter, and with ten other vessels in company forming the ‘first fleet’, he reached Botany Bay, New South Wales, on 18 January of the following year where he assumed the position of governor and captain-general. The poor produce grown locally could not supplement their initial supplies, so the Sirius was despatched to purchase provisions from the Cape in October. Following her return in May 1789 there was little improvement in conditions, and with the troops in a mutinous state it took all of Phillip’s immense character to maintain order. In the meantime he forged a friendship with the aborigines despite initial provocation and his receiving a spear wound to the shoulder during one misunderstanding. It was no surprise that the government tried to retain him in his position, but his wish to return to England was supplemented by illness, and he left for home on 11 December 1792 aboard the Atlantic, Lieutenant Richard Bowen, arriving back in England in May 1793 where he was granted a £500 pension. Whilst he recovered his health Phillip declined any further service but still discussed matters of the colony with the government. Eventually restored, he recommissioned the Alexander 74 for the Channel fleet in March 1796, and he retained her until October. He then held the command of the Swiftsure 74 from October 1796 until September 1797, in which vessel he raised a commodores’ broad pennant in the Gut of Gibraltar with eight sail of the line, five of which were Portuguese. His last active command was temporarily that of the Blenheim 90 from September until December 1797 in the Mediterranean. During 1798-9 Phillip commanded the Hampshire Sea Fencibles, and he was then appointed the inspector of the Impress Service, in which capacity he and a secretary toured the outposts of Britain to report on the strengths of the various posts. In the ordinary course of events he was promoted rear-admiral on 1 January 1801 and vice-admiral on 13 December 1806 when a special promotion was arranged to elevate Sir James Saumarez. Phillip died on 31 August 1814 at his residence, No 19 Bennett Street, Bath, having been promoted admiral on 4 June. He was buried nearby at St. Nicholas’ Church, Bathampton. On 19 July 1763 Phillip married a wealthy merchant’s widow, Margaret Denison, who was sixteen years older than him, but they separated six years later and she died in 1792. He married his second wife, Isabella Whitehead, on 8 May 1794 and she died in 1823. An opponent of slavery, he was regarding as owning an energetic, cheerful, optimistic and humane character, was modest, accurate and precise, but maintained a firm hand on the tiller and was a strict disciplinarian. Able to communicate in five languages, he had little use for correspondence other than that of an official nature. He was described as being small with a thin aquiline face, but with a sharp and powerful voice.